Welcome to the Yellowstone National Park Information Page. Where is yellowstone national park ? Yellowstone National Park is a national park located primarily in the U.S. state of Wyoming, although it also extends into Montana and Idaho. It was established by the U.S. Congress and signed into law by President Ulysses S. Grant on March 1, 1872. 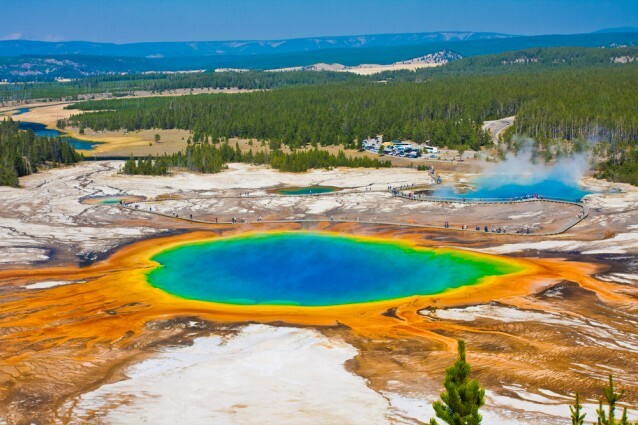 Yellowstone, the first National Park in the U.S. and widely held to be the first national park in the world, is known for its wildlife and its many geothermal features, especially Old Faithful Geyser, one of the most popular features in the park. It has many types of ecosystems, but the subalpine forest is the most abundant. It is part of the South Central Rockies forests ecoregion. Both parks means Yellowstone and Grand Teton National Parks – Keep Your Receipt! These Prices Change. Be sure to contact The National Park Service for current fee information or visit page . There is an accessible fishing ramp and platform on the Madison River at the Mount Haynes Overlook. This site is situated approximately 3.5 miles west (downstream) of Madison Junction or 10 miles east of the West Entrance. More than 220 lakes comprise approximately 107,000 surface acres in Yellowstone — 94 percent of which can be attributed to Yellowstone, Shoshone, Lewis and Heart lakes. Cutthroat trout are a primary food for bald eagles, osprey, pelicans, otters and grizzly bears. Bicycle Touring through Yellowstone National Park can be a rewarding experience although Advance Preparation is Essential. Approximately 300 miles of roadway are available to the bicyclist and commonly long distances exist between developed areas. Road Elevations range from 5300 feet to 8860 feet requiring extra time and energy between various points of travel. Some notable climbs inside the park are Craig Pass at 8261 feet, Sylvan Pass at 8530 feet and Dunraven Pass at 8859 feet. Snow covered roads and mountain passes prevent bicycling from November through most of April. Cool and cloudy days are typical during the months of May and June. July and August are characterized by warm days and cool nights, with occasional afternoon thundershowers. September and October generally have clear and cool days, providing excellent riding weather. However, occasional early season snowstorms can occur in late September and October. Accessible accommodations are found at: Canyon, Grant Village, Lake and Old Faithful. Call Amfac at 307-344-7311 for lodging information and reservations. Lodging registration personnel are prepared to assist you in obtaining accessible accommodations. There is an accessible backcountry campsite at Ice Lake. This site can be reached from the trailhead located approximately 3 miles east of Norris Junction or 10 miles west of Canyon (on the Canyon to Norris Road). This site is situated about .5 mile from the trailhead on an accessible backcountry trail. This site is reserved for those with disabilities, parents with children under six years of age, and adults over 62 years of age. Call the Park Service Backcountry Office at 307-344-2160 for information and reservations. Indian Creek, Lewis Lake, Pebble Creek, Slough Creek and Tower Fall – have accessible vault or pit toilets. Lewis Lake and Slough Creek Campgrounds have an accessible campsite. See the Camping Page for more information. Blind and permanently disable persons can obtain a Golden Access Passport. This is a free lifetime entrance pass to federal parks, historic sites and recreation areas which charge entrance fees. The Golden Access Passport admits the permit holder and any accompanying passengers in a single and private vehicle. It can be obtained from any visitor center or entrance station. Discounts are also given on federal use fees charged for camping, boat launching, etc. It does not cover fees charged by private concessionaires. In Discover Yellowstone an insert in the park newspaper Yellowstone Today given to visitors at all entrance stations during the summer months, accessible ranger led activities are indicated. There are many accessible roadside interpretive exhibits throughout the park. See the Ranger Led Activities Page for detailed information and schedule. Accessible rest rooms with sinks and flush toilets are located at all developed areas except: West Thumb and Norris. Accessible vault or pit toilets are found at West Thumb, Norris, most scenic areas and picnic areas. They are recognized as small brown/gray concrete buildings, each housing a single toilet. See the Picnic Page for more information and a map. When you arrive at Yellowstone, check with the rangers on recent bear and wolf sightings or radio locations of the packs. A pair of binoculars and/or a spotting scope are almost a must in viewing wildlife. If you have these then you are set. If you can borrow or rent them from a camera or sporting goods store, your time will be more productive. Most of the sightings are at a good distance, which is the best way to do it, especially the grizzlies. We have only seen the wolves in Lamar Valley. This is in the northeast corner of the park, from the northeast entrance to Roosevelt Lodge. This is the same area we sighted the grizzly bears. The best time for sightings is early in the morning (5:00 – 8:00 am) and 7:00 pm to sunset, but, wildlife may appear at anytime in almost any location. National parks are some of the few places where wild animals are easily visible in their natural setting – wild and free. Parks help protect the diversity of species that live in different regions of the United States. All of our lands, need to be well cared for if wildlife is to survive over the long term. Seeing wildlife is an exciting experience – the first time and every time! It’s important to realize that wild animals can be dangerous. A passive animal is not a guarantee of safety. It only takes a running child, barking dog, honking car horn or an approaching person to trigger an animal’s “fight or flight” instinct. For your safety and the animal’s safety, please learn and follow these basic guidelines when viewing, filming and photographing wild animals. You can be a good example for others while watching some of nature’s most magnificent animals in their natural habitat! Never approach or follow wild animals; respect their need for space. This includes not following fresh tracks. Do not block their line of travel or escape routes. Keep a safe distance from large animals (100 feet / 30 meters – the length of three buses – is recommended). Use a telephoto lens, spotting scope and binoculars to get “close”. Pull well off the road with your vehicle to prevent motor vehicle accidents. A vehicle also makes a good “blind” for watching animals, if you stay inside. Respect the special needs of nesting birds, denning animals & newborn or young animals – leave them alone. Elk can be particularly aggressive during calving season (May / Jun) and mating season (Sep / Oct). Do not park your car within 100 feet / 30 meters of a male elk. They’ve been known to bend fenders or worse. Herding animals into a better scene. Approaching or cornering, following or chasing. Throwing objects or calling out to change behavior. Direct eye contact, even through a camera lens can be threatening to an animal. Circling or standing around an animal by yourself or in a group. Yellowstone’s weather is unpredictable. In summer, it may be warm and sunny with temperatures in the high 70s / 25 C. At night in any given month, the temperature may drop close to freezing (32 F / 0 C). So it is best to come prepared for cold evenings and mornings, especially if you are camping or hiking. When you leave your campsite, please leave it prepared for possible thundershowers and wind.